It comes as a surprise to most South Africans to discover that land ownership does not extend to ownership of any of the minerals buried in the earth. Mineral rights belong to the State. ‘Mineral’ means any substance, whether in solid, liquid or gaseous form, occurring naturally in or on the earth. We are justifiably proud of our Constitution – it is one of the best in the world. The Bill of Rights section of the Constitution includes our right to an environment that is not harmful to our health and wellbeing and to have the environment protected for the benefit of present and future generations – through reasonable legislative and other measures that prevent pollution and ecological degradation, promote conservation and secure ecologically sustainable development and use of natural resources, while promoting justifiable economic and social development. In reality, economic rights and development goals often override environmental rights leading to a situation where people have to live with toxic air, polluted water and downright dangerous surroundings. Two companies, Rhino Oil & Gas and Sungu Sungu, have been issued Technical Cooperation Permits (TCP) by the SA Government for large swathes of KwaZulu-Natal. The TCP permits allow the companies to survey existing geological maps/seismic data and explore the area, but not to actually prospect – i.e. disturb the earth. Landowners cannot legally object to a permit holder entering their property, if they have been given 14 days written notice. Prospecting Permits (issued by Department of Mineral and Energy, not Environmental Affairs) allow the prospector to establish the existence of the mineral or gas by digging test holes or wells. They have the right to extract gas if they find it and, rest assured, they will take it to the next level should they find something! We need to prevent the issuing of prospecting licences as these will inevitably lead to full scale extraction. In the case of fracking the same extractive techniques which are employed in full-scale operations, are likely to be used in the prospecting phase. This has the potential to impact on the water, soil and air in the vicinity. Most of us agree that fracking in the Midlands will completely destroy the sense of place and our psychological wellbeing, let alone the environmental disaster it could cause. How do we ensure this does not happen? It is vitally important for landowners to be prepared and informed should prospectors arrive at their gate and to ensure they have followed the correct notification procedures. Often environmental consequences are not valued as much as the effect on humans, so make sure you know all about the health issues associated with fracking – pollution from toxic emissions, dust, noise and light, waste disposal, water pollution and the impacts from truck traffic. One of our best allies may be the local Municipality. Make sure that you participate in the public process of creating the Land Use Management Scheme (LUMS) for the area. Listen to others and speak up, don’t expect someone else to deal with these issues on your behalf. Become informed – the internet makes it so easy! Make friends with local officials. 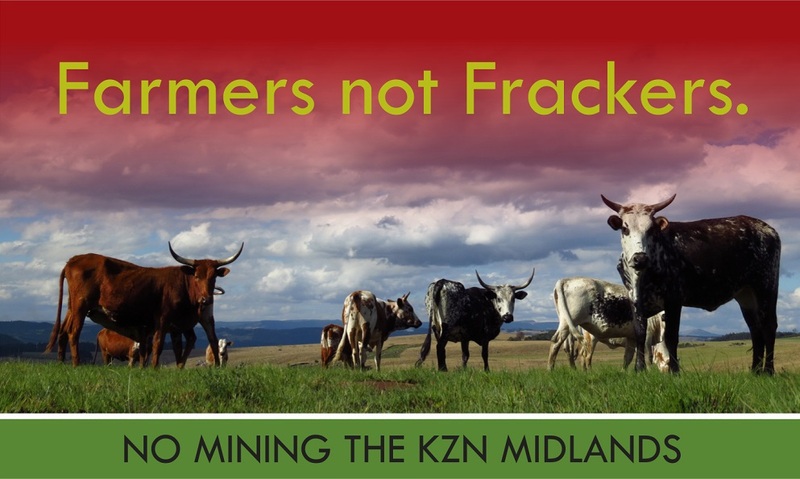 In the Midlands, land zoned for ‘Agricultural Use’ will need to be re-zoned for mining, so current local land use could help prevent fracking. 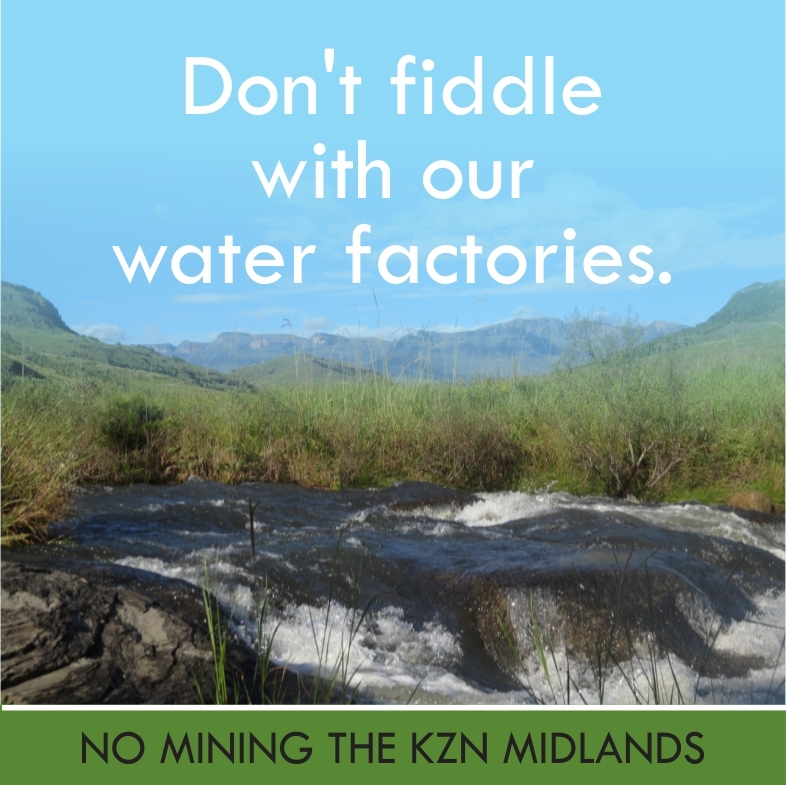 Help your Municipality to understand that they will need to deal with all the waste, water and environmental issues that mining creates, but without benefitting financially. Any benefit in terms of employment creation is likely to be limited and of short duration whereas the negative impact on tourism is likely to gravely affect municipal income and job creation in the area. Register and comment on Environmental Impact Assessments (EIAs) for developments when they arise in your area. Inappropriate development affects our health, water and food security. Start now on smaller projects to get used to the public participation process – don’t assume someone else is doing this work. We will achieve much more with a strong common voice. If we need to fight on behalf of the environment in court, at least our Natural Environment Management Act (NEMA) ensures that even if we lose, costs are not ordered against us. Let’s make sure that it does not come to that. Other places on our planet have successfully prevented mining with low-tech tactics like refusing to serve or host prospectors in restaurants and B&B’s, creating human barriers that last for months and relentlessly reporting minor infringements like insufficient ablution facilities for workers. The Midlands is renowned for its creativity, surely we will not allow prospectors to destroy our environment for short term exploitation of a non-renewable resource. 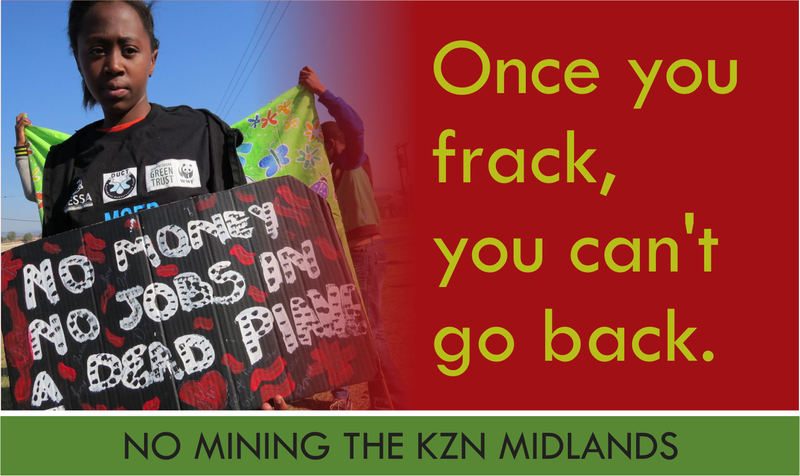 Support other communities fighting mining, such as Fuleni beside the iMfolozi Wilderness Area, Xolobeni on the Wild Coast and Mtunzini up the North Coast. See how they have approached their stand to keep their ecosystems functioning and learn the lessons to make your campaign more successful. Everyone can make a difference, no matter how small the action may seem. 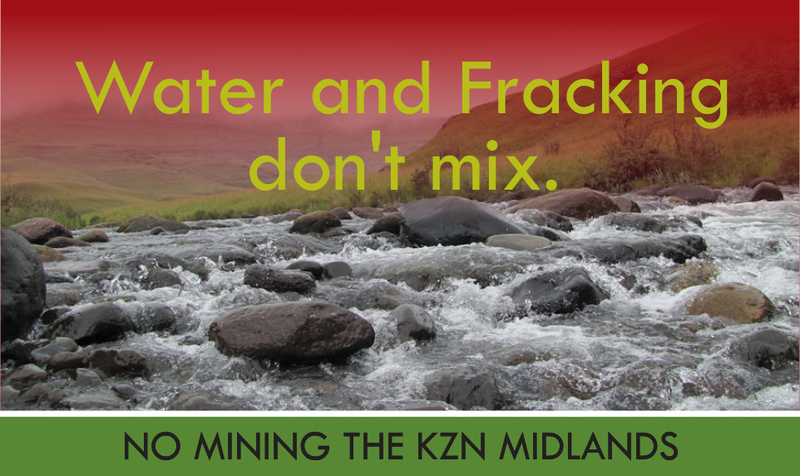 This entry was posted in Environmental Issue and tagged fracking, KZN Midlands, landowner rights, mining, river health on June 29, 2015 by Midlands Conservancies Forum. We need to get this far and wide….